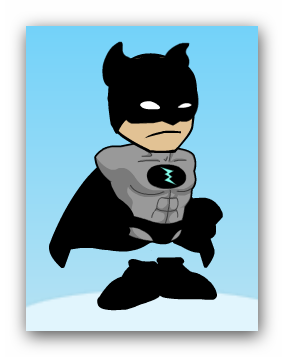 If you're a fan of GoAnimate's Lil' Peepz Superhero costumes and characters but are disappointed there is no Bat Cowl then I've made a video to show you how you can create your own Lil' Peepz Batman like character. The video is quite long and not the most exciting 14 minutes of your life but you do get to see me make the character in real time, explaining some of my choices as I go. The character will cost you 270 Gobucks (or US$2.70) as most of the components are not free. If you have some extra gobucks to spend then I'd suggest purchasing the Fighting Action pack just to give him a few of those necessary superhero moves. If you want to get started on yours right away this link will take you to the Lil' Peepz Character Creator.